We are skilled, highly specialised, award winning Natural Pool builders. Passionate about water quality, we design and construct bespoke Natural Pools and Swimming Ponds across the UK. 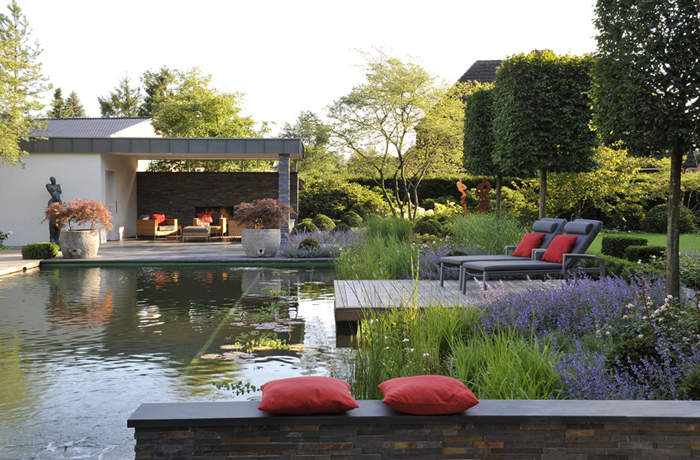 We understand pools, plants, people, wildlife and water and are passionate about bringing them all together in beautiful gardens that we design, landscape and plant for our clients. We design and construct domestic and public Natural Pools, and work closely together with Architects and Landscape Architects with project development from Concept stage through to finished Construction. Ensata’s eclectic team includes a water specialist, horticulturalists, landscape architect and pool design specialist, a plant designer, and our own highly skilled BALI accredited landscape craftsmen who construct your pool from start to finish. We share with you our own wealth of experience and enjoyment of our own award winning Ellicar Natural Pool, which is always open to our clients and open to the public to visit during the summer months. Our pools are crystal clear, free from chemicals, low maintenance and a magnet for wildlife. Like wild swimming in your own garden, in crystal clear water, filtered naturally by beautiful water plants. Similar looking to a conventional pool but with chemical free, living water to swim in. 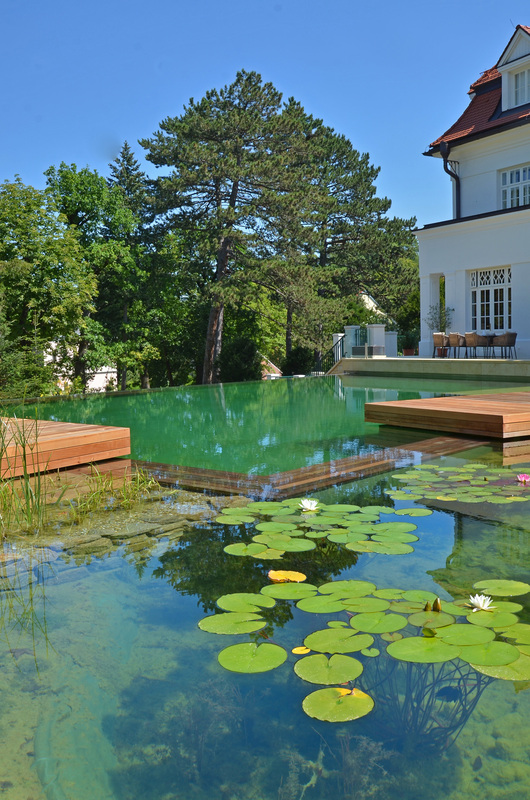 Our Natural Pools are built using the world-renowned Austrian Biotop system. A Natural Pool has a swimming area surrounded by beautiful water plants, which filter and purify the water naturally. Swimming in this crystal clear, living water, has proven health benefits, leaving you feeling energized and restored. The water plants, known as Regeneration Zones, are separated from the swimming area by submerged internal walls, giving you the unique experience of wild swimming in your own garden. Many people come to us tired of the work, chemicals and expense involved in looking after a conventional swimming pool. A natural pool conversion is low maintenance, wildlife friendly, with crystal clear water that is chemical free and low maintenance. Living Pools are similar in appearance to conventional pools - focus on swimming. Using specific Biotop filtration, the water is purified without the need for chemicals, to allow you to swim in crystal clear, pure, living water. The Hybrid Pool enables us to construct an optimum swimming area with a smaller regeneration area- by using the filtration technology of a Living Pool. This way you still enjoy swimming in crystal clear, living water whilst enjoying the beautiful water plants and ambience of a Natural Pool. With the surge of interest in Wild Swimming, we are seeing the European outdoor bathing culture spread rapidly in the UK. Spring 2015 saw the UK’s first Public Natural Swimming Pool – a Biotop pool - opening at the Kings Cross Brownfield Site - The Kings Cross Pond. perfect solution and a lower cost option. For anyone wanting a beautiful, clear and balanced wildlife pond in their garden, with the option of enjoying a dip on a hot sunny day, our Swimming Ponds are the perfect solution and a lower cost option. 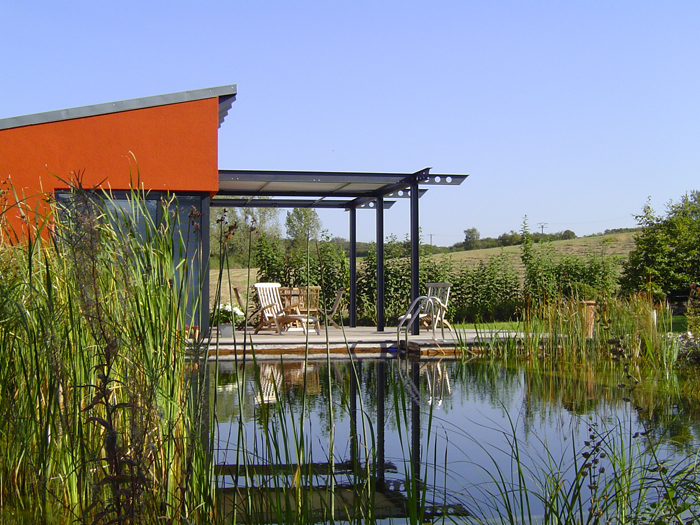 Built to our high standards and designed to be low maintenance, a swimming pond has an open water area for swimming, often a beach to encourage wildlife with additional features such as a jetty and deck. Combining our Natural Pool technology, enthusiasm and our water expertise, Ensata designs, constructs and renovates beautiful Wildlife Ponds and Lakes. With our passion for water quality and attention to detail, our pond and lake projects are designed to sit beautifully in their surroundings and be easy to maintain.